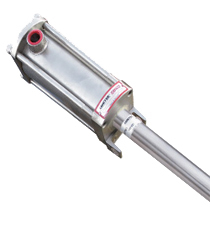 The Gemco 950 Series Mill Duty Housing is designed for applications where mounting a standalone rod style Linear Displacement Transducer (LDT), also known as a linear position sensor, is prohibitive. Potential physical damage, environmental conditions or mounting limitations are all elements that are involved in specifying a linear position sensor that will perform flawlessly for many years. The 950MD housing has been designed to eliminate all of the above problems by protecting the LDT from physical and environmental damage such as temperature, corrosives, shock & vibration, or dust and debris. Additionally, the 950MD offers a simple two point mounting scheme that can compensate for lateral and/or horizontal movement of the machine while in operation. The 950MD housing is also perfect for retrofitting existing cylinders with an LDT providing a continuous position feedback signal. • Sensor Length up to 240"
The 950MD Mill Duty Housing and 953 VMax Linear Displacement Transducer (LDT) are an ideal alternative to Limit Switches and lower cost linear sensors.